www.okeechobeejust4bass was fishing with John Kovalchuck from Michigan and Ken Werbrich from Ohio. Once again it was a challenging day on the lake fishing with artificial baits. The water temp high was 62 degrees. 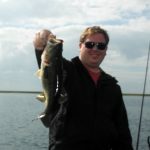 Here is one of the fish John caught today.